The Trio Curupira is formed by young musicians and composers of the state of São Paulo, who have exhibited to audiences in Brazil and abroad one of the most creative works of the instrumental genre. Featured in the Rock In Rio – Lisbon / 2004, the group was also a finalist in the Visa Instrumental Award that same year. The Curupira was born in mid-1996 of a happy meeting of ideals and affinities of its members: André Marques (pianist Hermeto Pascoal group since 1994), Fabio Gouvea and Cleber Almeida. Determined to develop a unique work, the result of musical and cultural research, based on the genuine music of Brazil, they run through all the rhythms and eliminate any border styles. The sound is dense, harmony is rich and personality is striking. The name was chosen by referring to the mythical character of Brazilian folklore in charge of protecting forests and animals. 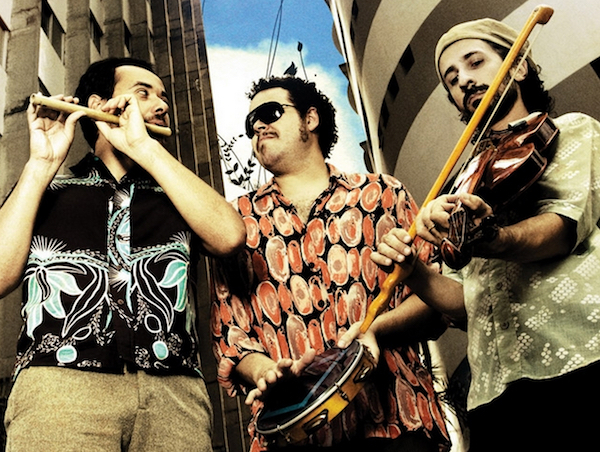 The trio took a similar mission: the defense of music and Brazilian culture. “We began with a totally focused on Brazilian music design, but we realize that we are against the musical prejudices We played the whole Brazil rhythms, but we are open to influences,.. Is of classical music, jazz, Arabic and flamenco music Music is music “says André Marques. Another great feature of the trio is the huge variety of timbres due to large exchange of instruments, both in concert and in the recording. In their presentations are used to traditional training trio (piano, bass and drums) and others with flute, cavaquinho, guitar, percussion, melodica, among other instruments. No Replies to "TRIO CURUPIRA"